Natyanjali Dance Festival: Bangalore's artistes . .
Day 2 at Chidambaram and we catch up with Bangalore-based dance guru and nattuvangam artiste Pulikesi Kasturi. 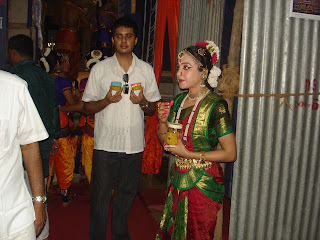 He is here to support the recital of dancer Aishwarya Nityananda, a student of guru Radha Sridhar. Pulikesi runs his dance academy in Bangalore's now-busy Yeshwanthpura area, outside the Malleswaram neighborhood which is a cultural hub. Bangalore seems to have better spaces and opportunities for young dancers today. "Nobody pays much but for up and coming dancers the platforms are many," Pulekeshi tells us. Much like in Chennai, Bangalore's senior artistes are also USA-birds at this time of the year, flying West to run camps and classes and hold arangetrams. 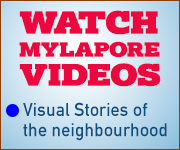 Here at the Natyanjali, artistes from Bangalore get featured year after year. Kathak dancer Roopa Ravindran is scheduled to perform later today. 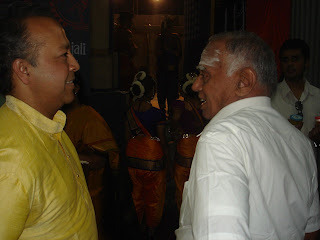 Photos here show Pulekeshi chatting with scholar-archaeologist R Nagaswamy and dancer Aishwarya backstage, after her recital.